San Francisco is one of my favorite cities in the US. Although I travel through San Francisco a number of times each year, I rarely get to spend as much time there as I would like. This fabulous dinner with friends was a poignant reminder I need to spend more time exploring the city’s culinary delights. Park Tavern offers an attractive combination of American classics mixed with French influences in a casual, informal setting. Chef Jennifer Puccio’s food is exuberant, bold and utterly irresistible. 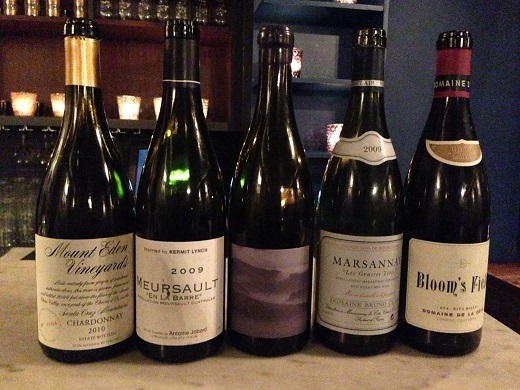 A well-chosen, somewhat eccentric collection of wines forms the backbone of the list curated by Beverage Director Casey Doolin. Our shared appetizers are all delicious, especially the Brussels Sprouts chips, which are a pleasant surprise. Fried sunchoke and charred albacore tuna placate our hunger, but only momentarily. They, too, disappear pretty instantly. The flavors are intense, layered and deeply satisfying. The highlight of the evening is without question the signature Poulet Noir, which is off the charts. Cooked upright and served in a screaming hot cast-iron pan with baby spinach, roasted potatoes and black truffle jus, the poulet is one of the most singular, delicious and compelling dishes I have had all year. The perfectly cooked chicken and black truffles are to die for. I would gladly return for round 2. Our two Chardonnays are fascinating to taste side-by-side. The 2010 Chardonnay Estate from Mount Eden has really begun to find its minerality over the last few months. Initially a bit bombastic, today the 2010 presents a much more classic and typical expression of the house style. The 2010 is striking for its energy and pure salinity. What a gorgeous wine. Antoine Jobard’s 2009 Meursault En la Barre shows the generous quality of the year in its succulent, open personality. Layers of rich, yellow-fleshed fruit emerge from a gracious Meursault that is drinking beautifully right now. Bruno Clair is the master of Marsannay. His Casses-Têtes is one of my personal favorites. The 2009 is striking in its weightless personality and gorgeous balance. Domaine de la Côte’s 2011 Pinot Noir Bloom’s Field has developed beautifully since I last tasted it a few months ago. Now that it has had a little more time in bottle, the 2011 is balanced, harmonious and drop-dead gorgeous. This is a fabulous expression of Santa Rita Hills Pinot in a cool, racy vintage. Our last wine is the 2011 Syrah Clary Ranch from Arnot-Roberts, which is just as beautiful from bottle as it was from barrel. Savory, perfumed and exceptionally refined, the 2011 graces the palate with total class. The 2011 is a bit ethereal and fleeting, but very pretty nonetheless. Readers visiting San Francisco should check out Park Tavern. The food, wine and service are all top-notch, while the informal ambience is warm and welcoming.